The tax evasion trial of Uli Hoeness has begun in Munich. The Bayern Munich president and supervisory board chairman could face a lengthy prison sentence if found guilty. In tax returns from 2004 to 2009, he is charged with not declaring 33,526,614 euros in income on which he should have paid 3,545,939 euros and 70 cents. Prosecutors also allege that he wrongly declared losses of 5.5 million euros. The case has attracted huge publicity in Germany. Unsurprisingly, given Hoeness’ profile in Germany, where he is understood to be on good terms with Chancellor Angela Merkel. On Sunday, the former premier of Bavaria expressed spoke about his desire for Hoeness to beat the charges. “Ninety-percent of Bayern Munich’s members and 92 percent of the fans want to keep Uli Hoeness,” Edmund Stoiber said on Sunday evening during an appearance on a German talkshow. “He’s indispensible in this situation particularly now during difficult times,” Stoiber added. Interest in the trial has been huge. 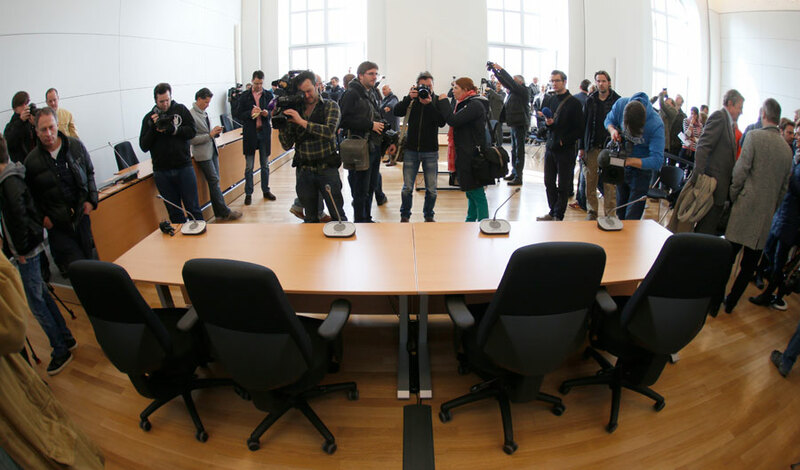 Here reporters converge on the Munich courtroom. But Wolfgang Huber, the former head of the Protestant Church in Germany, on the same TV show, said that “reporting yourself to the authorities has to become less important,” referring to the fact that many tax evaders, report themselves to the authorities to avoid prosecution or get a more lenient sentence. In January 2013, Hoeness filed an amended tax return in which he voluntarily disclosed a previously unknown Swiss bank account. He has said that he would have come forward sooner, but had been waiting for a Swiss-German deal for assets in Swiss banks to go into effect. However, by the time he approached officials, the agreement had already been rejected. Bayern Munich’s board has stood by Hoeness – under whose stewardship the club won the Champions League, the Bundesliga and the German Cup in 2013. His offer to resign until after the court case, was rejected by the club. The penalty for tax evasion can be 10 years behind bars, though the prosecution says it will seek a seven-year term. There is an irony to Hoeness’ current predicament. He has been one of the staunchest supporters of UEFA’s Financial Fair Play rule (FFP) – even to the extent of wishing for the demise of the wealthy clubs who fail to comply with the regulations. Speaking after Malaga fell foul of the FFP rules and were banned from European football for a season, Hoeness said: “The Malaga punishment was a good beginning. This gentleman [Al-Thani] did not pay his bills. He lived beyond his means. But I hope this was only a start. If they kill the small clubs and let the big ones live then that is not okay. The phrase ‘people who live in glass houses shouldn’t throw stones’ springs to mind. Having emerged from a serious car crash and walked away from a plane crash (he was the only survivor), Hoeness will be hoping his survival instincts once again come to his rescue.